Why settle for standard when you can have amazing. If you’re going to renovate your kitchen know it’s something you’re only going to do every 15 to 20 years. Don’t be discouraged if you are short on ideas or inspiration. Or if you just don’t have a clear focus on your design. This is a large expense and you want to make sure that it looks every bit as great as you dreamed # no regrets. Your designer should take you to a kitchen showroom to help you make the decisions when it comes to designing your kitchen. It’s difficult to see pictures of different designs and products and try to imagine how they will all fit together. It’s also a really great place to take inspiration if you stuck and don’t know how to move forward with your design. Showrooms allow you to touch the different materials first hand helping to make decisions on what materials and finishes look well together. Kitchen showrooms also showcase local craftsman who can create something unique. The kitchen showrooms are also able to offer installation for all pieces for a low price when bundled. 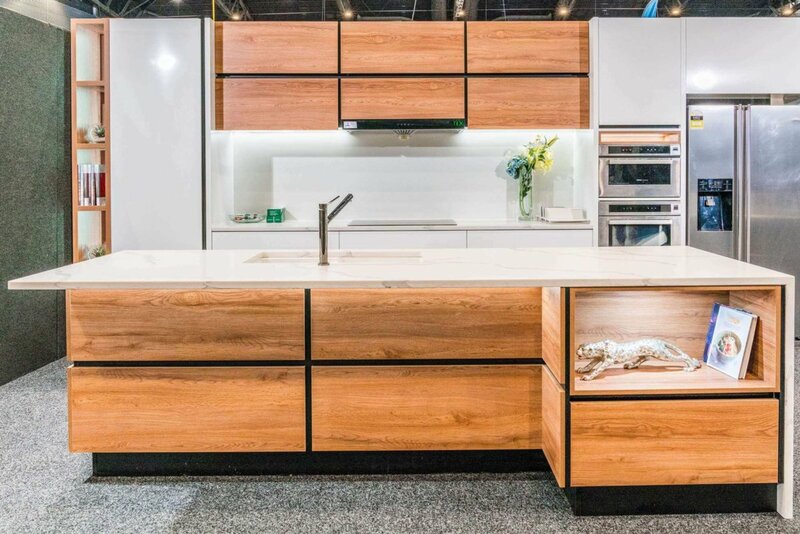 The right kitchen showroom is going to have everything you need and more. Making getting out your kitchen renovation with your designer a joyous Adventure. Of course you know you need a stove, sink and fridge, the real question is what finishes do you want for these appliances. Kitchen showrooms let you see a wide array of appliances with different styles and features. You can also see how it fits into the precise space you have to make decisions about placement. Showrooms are going to show some of the top of the line appliances and you’re going to be able to compare and contrast different features that you want in your new kitchen. This is going to ensure that you have features you can’t live without like a self cleaning oven or gooseneck faucets and other features that you believe are important to your design. You can find them all in a showroom without having to go searching far and wide for them. You’’ll be able to see whether soft-close drawers and cabinets are really as amazing as they say they are or if you really can’t survive without a farmhouse washbasin. Whatever it is that you seen in the magazines and on Pinterest you’ll be able to experience in a kitchen showroom. Maybe you really like a kitchen bar stool or breakfast nook setting for the display but the colors don’t match the rest of the design you have in mind. Maybe a backsplash is really pretty but you’re wondering if it comes in a different color for less busy design. Kitchen showrooms can contact the seller or designer and ask if they can manufacture it in another way to satisfy your taste. If the seller or designer you would like to work with can’t make changes a showroom can suggest craftsmen or designers who would be a good fit for your idea. This gives you the opportunity to get something truly unique for your kitchen renovation. Even after you found all the perfect pieces, you have to make sure proper measurements are taken to ensure but everything you want to place in your kitchen will fit. kitchen showrooms are able to provide installation services for products that may need to be specially installed for your renovation, such as cabinets or subway tiles. Often they can recommend contractors and other teams you may need for your kitchen renovation. The best thing about a kitchen showrooms are the prices. Everything is together, from the appliances to the custom backsplash to the breakfast bar stools. All these things plus installation can often be covered in its price, so there is no extra work or money once everything is picked out. Showrooms can also assist in organizing what schedule the installers have to help finish your kitchen renovation on time. Truly, the kitchen showroom is one of the most important stops to make when starting a kitchen renovation. Whether you have the perfect idea of what you want for if you have no clue where to even begin. No kitchen renovation should be done without looking into a kitchen showroom. Showrooms put you in a perfect place to see all the different options first hand. Allowing you to see what materials and features so with one another to ensure that you were picking something that is not only going to last but that you’re going to love in your new kitchen. Showrooms can help find craftsmans to customize pieces to make your renovation designs come true because you should never have to settle for less. They can also take care of insulation of any piece that they show. All of this and it fits your budget without having to go to a whole lot of places to finish one job. Kitchen showrooms are a great place that you and your designer can use for more inspiration and to get the job done.